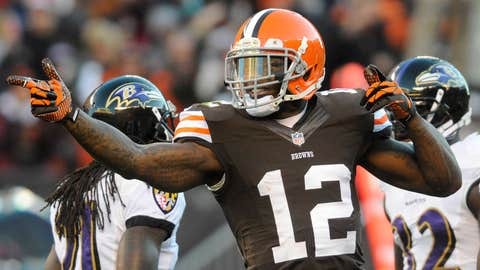 BEREA, Ohio — Cleveland Browns WR Josh Gordon and OL Joe Thomas each have earned awards from the local chapter of the Pro Football Writers of America (PFWA) for the 2013 season. Gordon was a unanimous selection for the PFWA Player of the Year and Thomas was named the PFWA Dino Lucarelli ‘Good Guy Award’ winner. The pair will be honored at the 34th annual Akron Browns Backers banquet in May at the Tangier Restaurant. During a season in which he has worked with three starting quarterbacks, Gordon leads the NFL in receiving yards (1,564) and yards per catch (19.6), while playing in just 13 games. He is also first in the NFL with an average of 120.3 receiving yards per game and fourth in the league in yards from scrimmage with 1,652 (1,564 receiving and 88 rushing). Gordon’s 1,564 receiving yards are a franchise record. His seven 100-yard games are also club a record and are tied for most in the NFL this season. He is leading the club with 80 receptions, tied for the sixth-most in a season by a Brown. Gordon became the only player in NFL history to top 200 receiving yards in back-to-back games. He totaled 774 receiving yards in four games (Weeks 11-14) and 649 in three (Weeks 12-14). Both figures are NFL records, according to Elias Sports Bureau. The ‘Good Guy Award’ is given annually to a player for his cooperation with the media and for the way the player carries himself in the community and with his teammates. Thomas was one of 11 players nominated by the local media for the award and the first player to ever receive the award twice. Voted offensive team captain by his teammates, Thomas has started all 111 career games at tackle and has not missed an offensive snap since being selected by the Browns with the third overall pick in the 2007 draft. His stretch of 6,859 consecutive offensive snaps is the longest active streak in the league. In 2012, he was one of three finalists for the NFL Walter Payton Man of the Year award. Thomas has been selected to the Pro Bowl in all six of his NFL seasons and trails only Jim Brown (9) and Lou Groza (9) for the most by a Browns player.